We at Dieselbikes know this is not 100% fact! 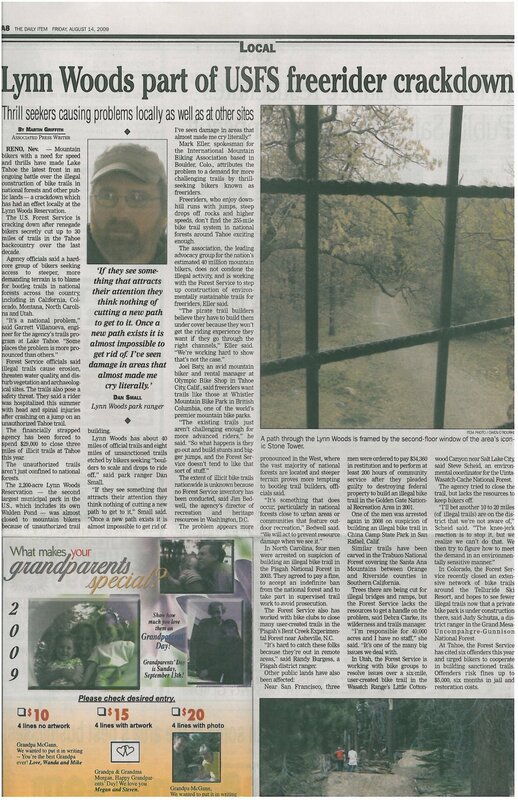 This month an article written by the Associated Press and published in the Boston Herald (and other papers nationwide) made reference to Lynn Woods and how mountain bikers are destroying the trails. We received several e-mails from local area riders asking if the article was accurate and if new problems were developing. We spoke to park management after reading the article and they assured us that no relationship problems exist between themselves & mountain bikers in Lynn Woods. The article referred to the concerns of the National Forest Service and their attempts to crack down on rogue trails being cut by a very small group of aggressive mountain bikers across the country. Lynn Woods is city owned property and has nothing to do with the National Forest Service, but Lynn Woods is a well known local mountain biking spot and it was assumed that Lynn Woods was part of the problem. Some of you may remember back to 1998 -99 when the park did have a problematic user relationship, but that has all changed and we are working in close collaboration with park management to ensure our relationship remains strong. Lynn Woods is not perfect (no place is) and we continue to deal with rogue trails that occasionally pop up. Some of these trails predate Dieselbikes, but in general the problems that once existed in Lynn have been greatly reduced and park management is generally happy with the results of our collaborations.